Pharaohs were entombed with bee pollen. The Greeks called it ‘life-giving dust’ and consumed it to retain eternal youth. What did the ancient Egyptians, Greeks, Romans and Chinese know about pollen’s effect on men’s health that we are only now rediscovering? The latest ‘buzz’ on bee pollen is that it can boost men’s health by helping to keep you younger, healthier and free of allergies while it’s also been claimed to improve women’s health by preventing infections and reducing fatigue as it builds up the blood’s oxygen-transporting hemoglobin in those who are anemic. Pollen grains are the minute microspores (male seed) of flowering plants, which are required for their reproduction. Pollination is the transfer of pollen from the stamen to a pistil within a flower, resulting in fertilization and the development of fruit and/or seeds. Nearly all nectar-containing flowers utilize insects like bees, butterflies and moths to perform their pollination. Without these insects, most plants could not reproduce themselves and would become extinct. Every tiny orange pellet of bee pollen contains 2 million pollen grains. A single teaspoon of pollen (the typical therapeutic dose) contains over 2.5 billion grains of flower pollen that has taken one bee, working during every hour of daylight, at least a month to gather. 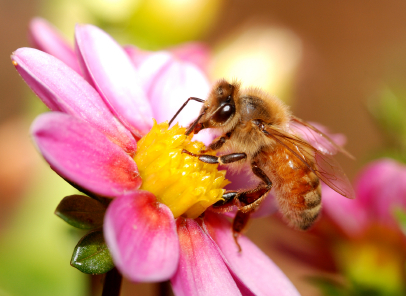 Bee pollen is considered by many to be the ideal natural health food. It is 40% protein by weight (mostly as free amino acids) and has greater concentrations of B vitamins and vitamin E than any fruit or green vegetable. Just 1 gram of pollen contains 10-15 mg of vitamin C.
Rutin is a glucoside involved in strengthening the capillary system of our vascular network. It helps to prevent weakening or rupture of these tiny vessels, averting TIAs or brain-threatening hemorrhagic strokes. The richest concentration of rutin found in nature is in buckwheat pollen collected by bees. All over the world, bee pollen has been used for an astounding number of purposes, including enhancing vitality, improving athletic endurance and rebounding from illness. Chronically anemic patients have their hemoglobin (the oxygen-carrying component of blood) significantly increase by taking pollen. Consuming pollen from a local-region can help eliminate hay fever by desensitizing the body to seasonal (pollen-based) allergies. It can also aid in fighting viral infections like the flu and research has shown that an unidentified substance in pollen inhibits the growth of bacteria.